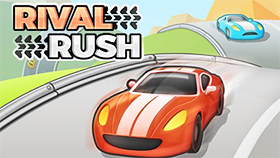 Uphill Rush 2 is a very exciting racing game released by spilgames. The game has cute graphics, colorful and is suitable for all ages, especially children and families. 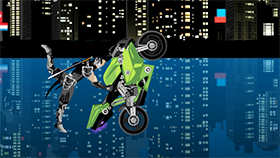 In the game, you will control a motorcycle and participate in the Race. There are a total of 8 races, 4 races have been unlocked and the remaining are locked, you need to complete different tasks to unlock them. There are three levels for each race: Easy, Normal and Hard. You can customize your character such as changing gender, skin color... For clothes and motorbikes, you have to buy them with money. Money will be in the Race. After completing the Race, you will be rewarded with points and give you money. This amount depends on the race completion time, the amount of gold you get on the track, and your special actions. The most interesting feature of this game is the turbo system and acrobatic moves, very nice motor show. The game also supports 16 different languages and allows players to experience the game on the web flash. Use 5 to active turbo. Use 1, 2, 3, 4 to perform special actions. Pay attention to the mini map to know the terrain ahead. You can pause/restart/resume and turn the sound on/off on the game screen.